I’ve called this Christmas season “The Ghosts of Christmas Foods Past.” This is my first holiday season understanding my food sensitivities, and there are a few foods that I’m struggling with missing out on. My biggest issue is with dairy – milk, cheese, butter, all of those things trigger headaches and eventually migraines. An abundance of gluten turns me into a sluggish, bloated and unhappy person. So, with the obvious loss of cheese and crackers, I’m also dealing with the absence of a few other holiday treats. Eggnog is out (and the soy replacement isn’t doing the job), butter cookies, butter cookies with frosting (I have a real butter cookie problem) and even true blue hot cocoa are gone. In the weeks after Thanksgiving, I lost my head a bit regarding food. I started to think that “maybe just a little bit” of the things that have done me wrong would be OK. Wrong. The week after Thanksgiving and the indulgences during that time created a migraine that took three days to pass. So, I needed to hit the reset button. I needed to come back to the way of eating that would serve me, my brain and my body in the best possible way. I started researching juices and their potential health benefits. 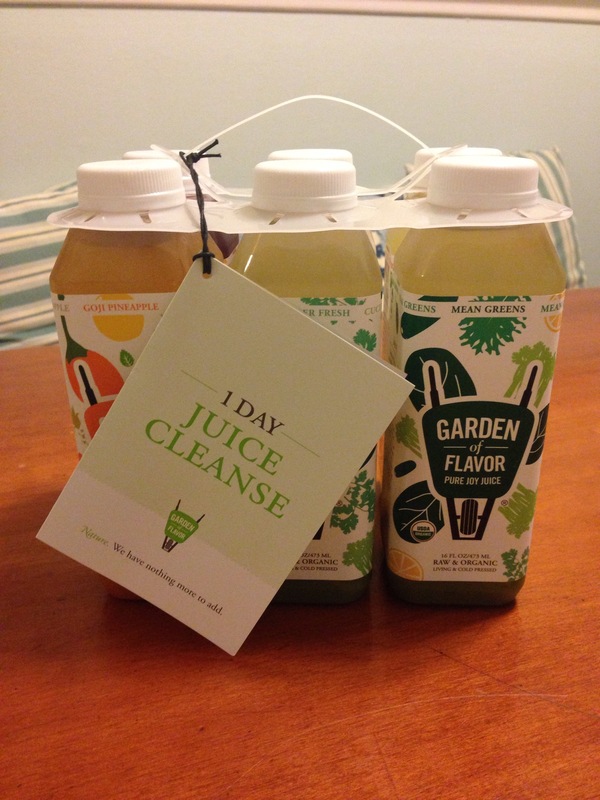 Lo and behold, a company right here in Cleveland, Garden of Flavor, is leading the way with cold pressed juice. I had seen their products in Heinen’s, one of our local grocery chains, and reached out to company owner Lisa. Let me say this – blogging has given me the opportunity to meet many wonderful people. I think Lisa might be the absolute nicest I’ve met. She invited me to the plant where they press and bottle juice, took time out of her day to give me a tour and is just genuinely nice. Aside from the niceness, her skin glows. That’s the only way I can describe it. I left the plant with enough juice for a 1 day cleanse and samples of the other flavors that Garden of Flavor bottles. I was particularly interested in the flavors that included probiotics. Now that I’m living in dairy-free land, getting probiotics into my system is important. 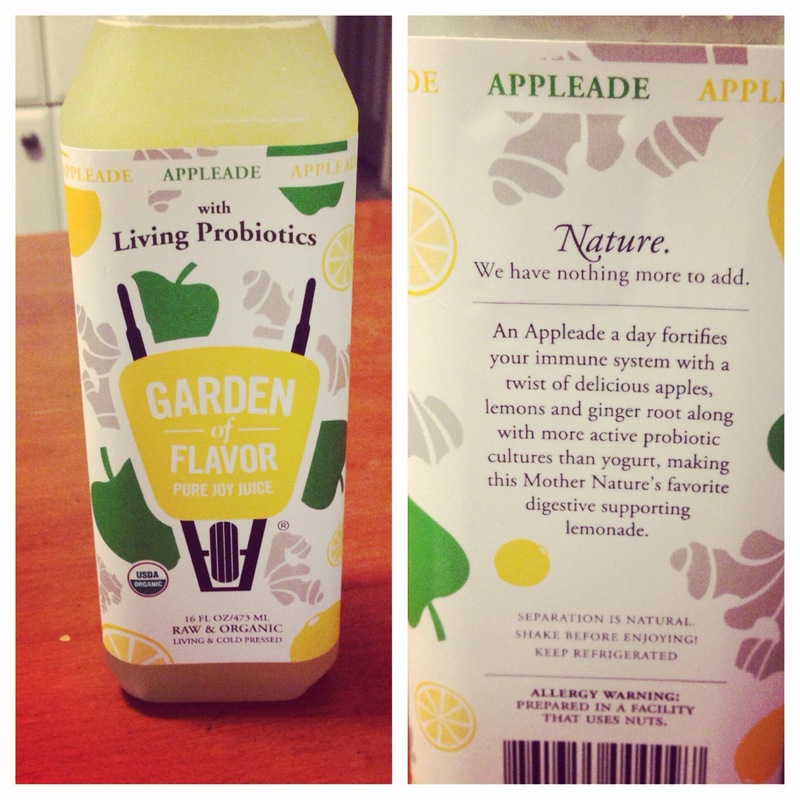 I’m a loyal kombucha drinker, but hadn’t explored other probiotic beverages. After resisting the temptation to drink everything on the way home, I dove into the Appleade when I got in the door. It was amazing. The apple, lemon and ginger together gave it a tangy/sweet kick that I really enjoyed. I’m imagining it on a hot summer day and I can’t wait to try it again when the weather warms. Oh, and the 1 billion count probiotic makes my belly happy. A cautionary word before I talk about my one day cleanse. I did not go into this believing that I needed to lose weight or that I needed to “detox.” In fact, what I love about Garden of Flavor’s philosophy is that they never use the word “detox.” Cleanse directions included with the six pack instead read “reenergize and recharge.” That’s exactly what I was looking for. I followed the recommendations to begin the morning with a cup of hot water and lemon juice to help improve my digestion. I also cut back to only one cup of coffee and drank decaf mint tea for the rest of the day. Outside of the juices, when I got a little hungry in the afternoon, I ate a bit of pineapple and an avocado. #1 Goji Pineapple – 7am Pineapple, apple, goji berry, ginger root, mint, lemons. A mix of sweet and spicy that can only come from the ginger tucked inside. Post hot lemon water, this tasted yummy and was eye opening for the beginning of the day. #2 Cucumber Fresh – 9:30am Cucumber, celery, lemon, parsley. Light, and almost airy in taste with the green finish from the cucumber. I’ve never realized how much I associated cucumber with summer, but when I opened this bottle, I immediately thought of warm weather and being outside. #3 Mean Greens – 11:30am Cucumber, celery, romaine, kale, spinach, lemon, parsley. I drank this juice immediately after a meeting with a new yoga studio I’ll be working with, so my stomach was a little upset from the anxiety. This turned out to be my least favorite of the juices. It felt a bit like a repeat of number two, but meatier? That doesn’t sound exactly right, but it’s the best description I can come up with. #4 Twisted Roots – 1:30pm Carrots, beetroot, lemon juice. Who knew that carrots and beets together could be so damn good? Interestingly enough, while at the juice plant, one of Lisa’s kind coworkers shared that runners are using beet juice as a supplement to improve performance. The science is interesting, but the main effect may be a lowered blood pressure level. Aside from the potential running boost, I learned that I really love beet juice. Who knew? #5 White Knight – 4pm Water, cashew nuts, agave nectar, cinnamon, vanilla. This bottle came at the exact right time. It’s called the White Knight for a reason. As a non-milk drinker, I’m also thrilled that it was a delicious alternative. The cashew flavor and cinnamon made for the feeling of drinking a milk shake. Bonus? A little of this in your coffee is delish. Warning – White Knight is calorie dense. If you’re thinking of cleansing, you can not drink 4 or 5 of these in a day. I could barely finish the whole bottle over the course of an hour. #6 Turmeric Tonic – 6pm Water, lemon, blue agave, turmeric, ginger root, mint, cayenne pepper + probiotic organism. The last juice of the day is light and was a perfect counter for the White Knight. The turmeric and cayenne bring the wow factor and give the juice a nice kick. I drank this one slowly, still rather full from the 4pm juice. And that was my day. How did I feel? I never felt as if I were starving, never felt hungry in an overwhelming way. I had plenty of energy, powering through a meeting, lunch meeting with my knitting group and my daughter’s band concert. I went to bed at a reasonable hour and woke up the next morning feeling great. In fact, my hardest kettle bell workout of the fall was Friday morning and I felt like I killed it. I felt great through Friday and into the weekend and got just what I needed – the opportunity to hit the reset button. You can find Garden of Flavor juices at Heinen’s, Whole Foods, Mustard Seed Market and other small grocers in the area. For a complete list of locations, visit the Garden of Flavor site.